This page is dedicated to the Photographs and memories of Hugh Finnegan whose parents came to England originally from Ireland. Hugh's mother came over in 1931 and his father in 1932. Hugh's parents both worked in London. Hugh's brother Eugene featured in many of the photographs was born at Blackheath in South-East London in 1939. The Finnegans moved to Portsmouth later that year as Eugene's father went to work on the military tunnels under Portsdown Hill to the north of Portsmouth. His Father later joined the Army in 1941. 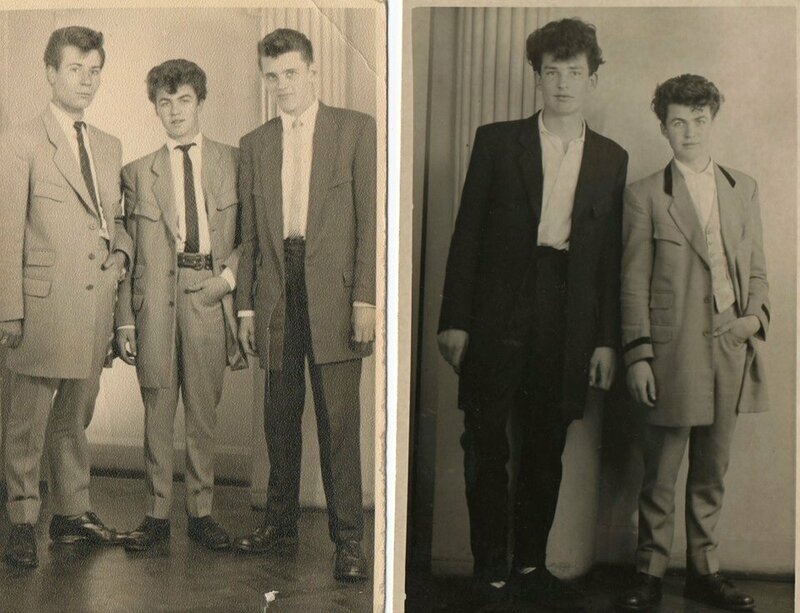 Hugh and his brother, Eugene became Teddy Boys during the mid 1950's and Hugh has supplied some of the best photographs of original 1950's Teds that have surfaced in recent years. Hugh has kindly given his permission for these to be reproduced on the Edwardian Teddy Boy website - thank you Hugh Finnegan. 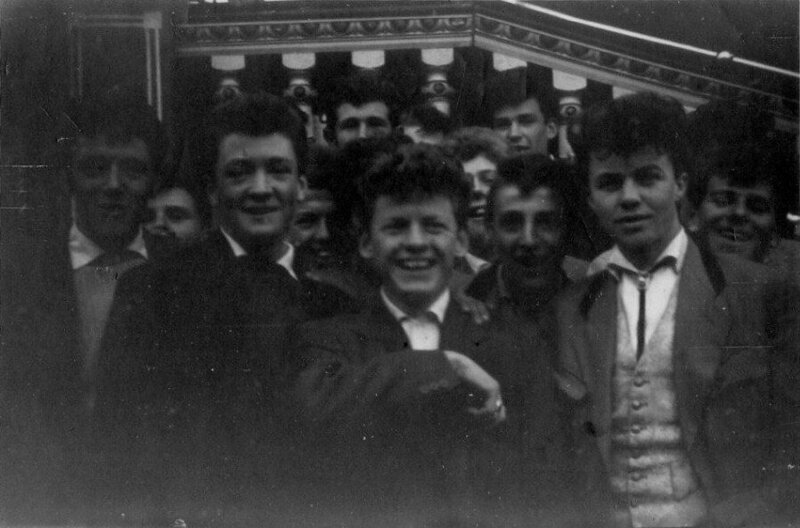 All the photos that Hugh Finnegan has kindly released for public viewing are of the "Southsea Boys". Hugh says that examples of other Ted mobs in and aroung "Pompey" were the Eastney Boys, Portsea Boys, Flats Boys and the Wymering Boys, just to name a few. Hugh says that 1957 was a good year as his wages increased to £4 - 8s - 6d a week and in those days it was a lot of money. Hugh states "It would only then take six weeks to save up for a suit , after I had paid my mum for house keep which was £1 - 5s a week - good old days!!" 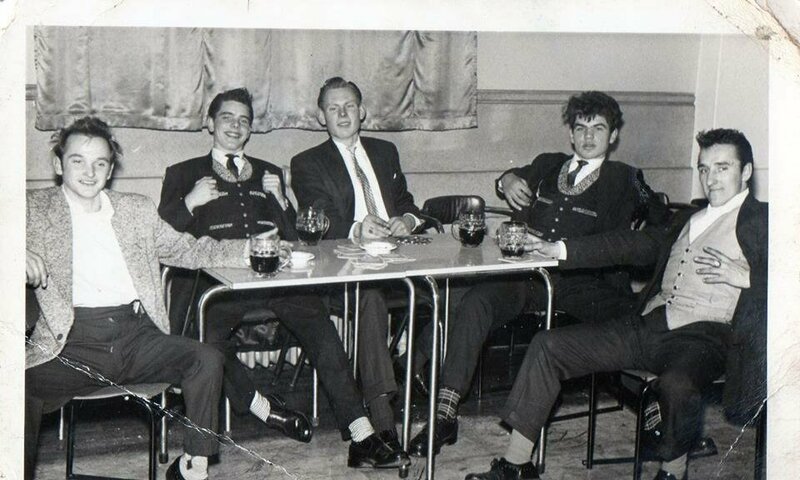 I first became aware of Teddy Boys in 1954. I was still at school, but my older brother Eugene was an apprentice bricklayer. He had money to spend on clothes and I used to watch him and his mates standing on the corner, all done up with drapes and drainpipes. Eugene also had a bootlace tie which I really reckoned and lusted after. From the start, I was fascinated by the look and the style and the attitude of Teds, and wanted to be one of them. 1955 Jeromes Studios, Commercial Rd, Portsmouth. "Posing on a Saturday Afternoon". Left to right back standing: Graham Butcher,?? Cotton, Roly Jackson and Brian Frost. Front: James Kemp and Frank Hulse. As soon as I was old enough in August of 1955, I left school, got a job as an apprentice plumber and started to save up for a suit. After three months I had enough to buy a second-hand grey drape. It was really long on me, had patch pockets and looked the business. I loved it. By Christmas, I was off to the dances at the end of the pier in Southsea, rigged out in a grey drape, drainpipe trousers and my brother’s waistcoat and bootlace tie. 1955 Sallyport Old Portsmouth. Left to Right, back row: Albie Deacon, Eugeen Finnegan, Adrian Cutler, Barry Stewart, Buller Wilson. Front row. Hugh Finnegan, Roger Sands, Alfie Gunner and Robbie Paton. Hope you all like these pictures from the 1950's - there is not many of us left now. A year later I was buying all my own Ted gear, including made-to-measure suits. There was a tailor in Portsmouth called Dennis Lee who was famous for turning out really good drape suits and I was paying between £14-20 a time for mine. Getting a tailor-made suit meant you had all sorts of choices of not only drape length and how tight your trouser bottoms were, but also pocket size and style and colour of the lining. For most of us it was the brighter the better. 1955 South Parade Pier Portsmouth, there were two Dance Halls on this Pier and in those days it cost 1s 6p to get in. There was a band in each Hall and it was full of birds, thats where I met my Wife 55 years ago. Boys names L to R Barry Rayner, Buller Wilson, Robbie Patton, Eugeen Finnegan and Barry Stewart. They were good old days. In those early days, most of the major dance halls were still putting on big bands and orchestras like Ted Heath and Eric Delaney rather than Rock ‘n’ Roll acts, but there were some lively little clubs and places to gather. One notorious dance hall was The Empress in the north of the city, and it was the scene of one of the biggest mass fights I have seen or been involved in. It was a Christmas party for people working at a local brewery, and we were about 10 strong and had been invited by a mate who worked there. Some Marines were in (we used to call them bootnecks) and they started on us needing a haircut and how stupid our clobber was and the usual piss-take stuff. 1955 Hugh Finnegan and friends at Billy Mannings Fairground, Portsmouth. Note the bootlace (bolo) tie worn by Hugh and the offset velvet collar. It all kicked off suddenly over a spilled drink or some other excuse. After a while the Police came crashing in, along with the Naval Shore Patrol. Portsmouth being a major naval port, there was always trouble when local boys met up with the Skates, as we called them. The thing was that no local Pompey man would dream of joining the Navy, but it was an attraction for people from up North who thought it would be wonderful to join the Navy and see the world. Being from Birmingham or Bradford and ‘foreign’ was another excuse to have a crack at skates. The Shore Patrol would be a gang of beefy sailors with white belts and gaiters and big billy-clubs who toured the city at night packed into blue Dormobile vans. They were technically there to stop sailors causing or getting into trouble, but if they had the chance they would join in and give us local boys a kicking. The brewery worker who invited us to the party got the sack on the Monday morning, but the rest of us got away pretty lightly. It didn’t take much in those days for something to spark off a set-to, and the worse thing was not the injuries but the damage to your expensive clothes! 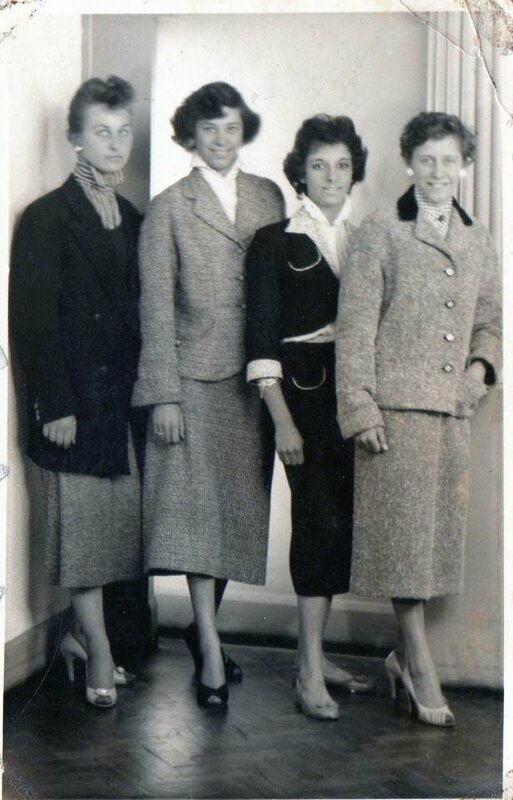 1955 Teddy Girls - at Jerome Studios, Commercial Road, Portsmouth. Of course if we weren’t scrapping with skates or bootnecks, we would be having a set-to with other gangs. It was all very territorial, with gangs established in most areas of the city. Each gang would have its own pub as a base and headquarters for them and their birds, and nobody from another gang would ever go into a rival pub unless invited. TEXT NOT COMPLETED - UNDER CONSTRUCTION. 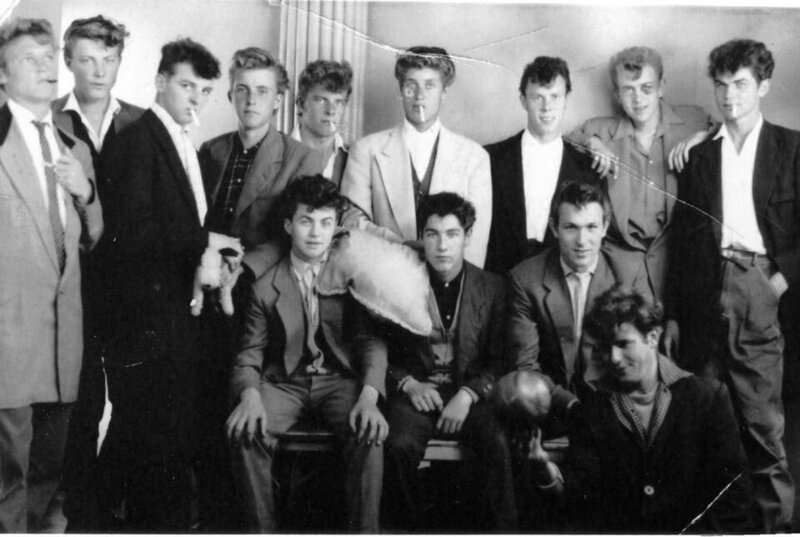 1955 Teddy Boys: Left to Right: (Back Row-standing): Derek Field, Albie Decon, Graham Butcher, Roger Sands, Bob Absolem, Brian Frost, Brian Mainard, Phil Cox and Eugeen Finnegan. 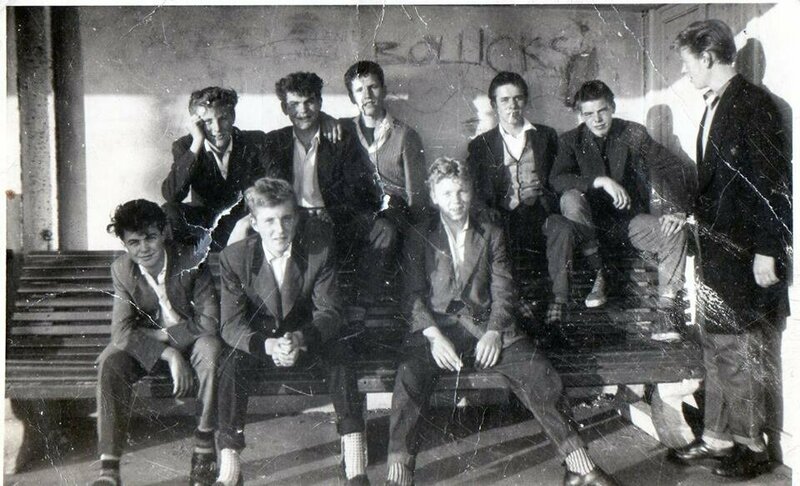 (Front Row-sitting): Hugh Finnegan, Brian Stanley, Johnny Valentine, Peter Johnson. - with Hugh Finnegan at Jeromes Studios, Commercial Street, Portsmouth. 1956/57 Somers Street, Portsmouth - those were good days. 1956 A photo taken on the corner of Somers Street, Portsmouth where I lived, in this photo I have a green suit with a small check in it, and velvet collar, also a 6in waistband on the trousers. 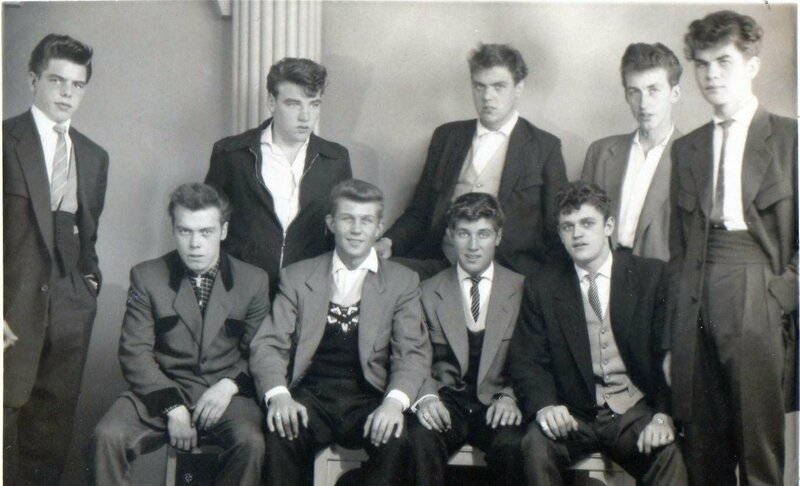 1955: Another Jerome's Studios photo, Portsmouth. Note the use of half-moon pockets on five and four button fronted drapes in 1955. 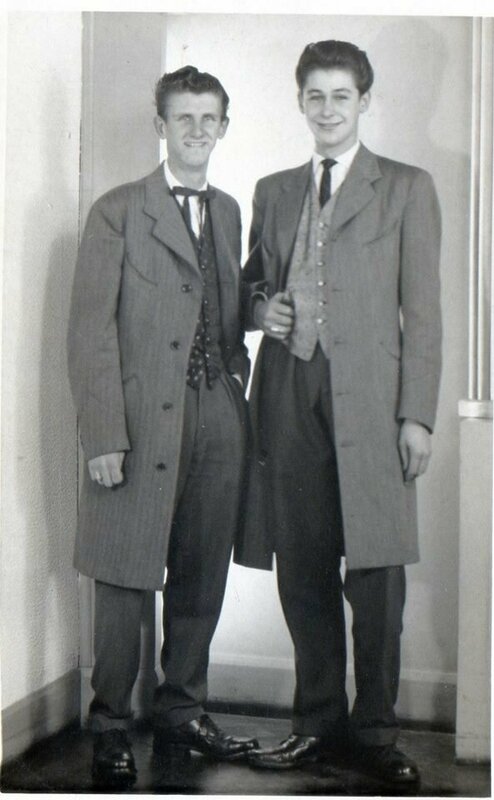 Left: Frank Hulse and on the right: Roly Jackson, he was Hugh Finnegan's business partner for 40 yrs and sadly passed away in 2007. 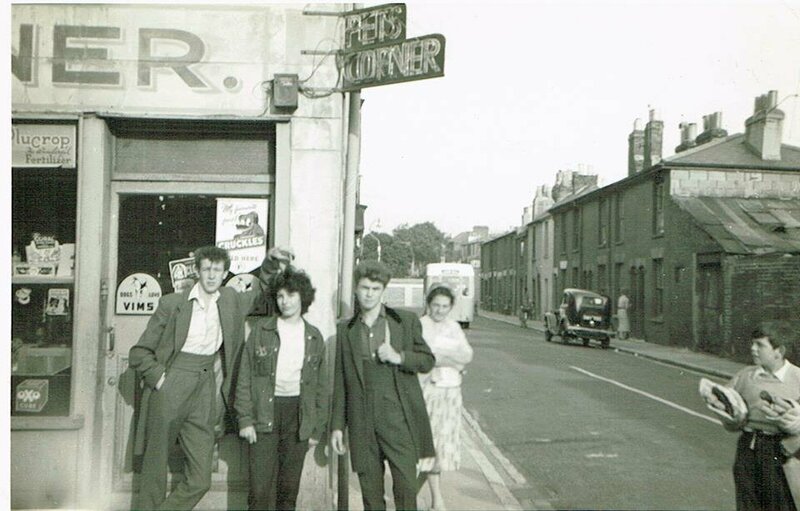 1955\1956 another one taken Jerome's Studios Commercial Rd Portsmouth. At the back L to R: Buller Willson, Bob Absolem, Bob Smith, Harry Harris and Eugeen Finnegan. Front row L to R: George Marshall, Johnny Moor, Brian Frost and Tony Morton. Note George Marshall (left / front) is wearing a Drape that has velvet on its pockets and vandyke cuffs with a Bootlace (bolo) tie and it's 1955/56! 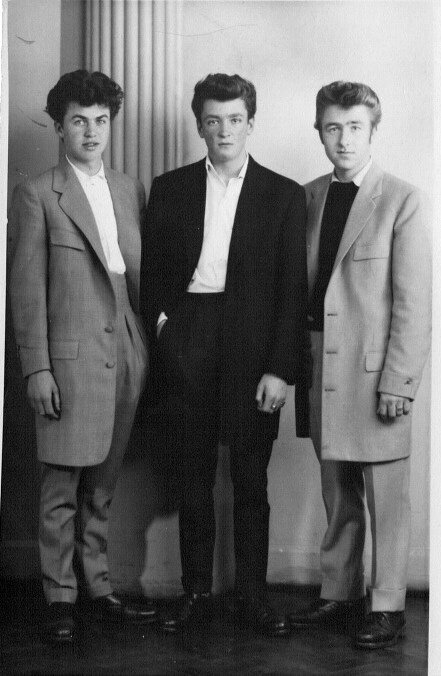 1956\1957 Posing in Jeromes Studios on a Saturday afternoon in Portsmouth. Left to Right: Hugh Finnegan, John Furlong and Brian ????. 1956 Jeromes, Commercial Road, Portsmouth. 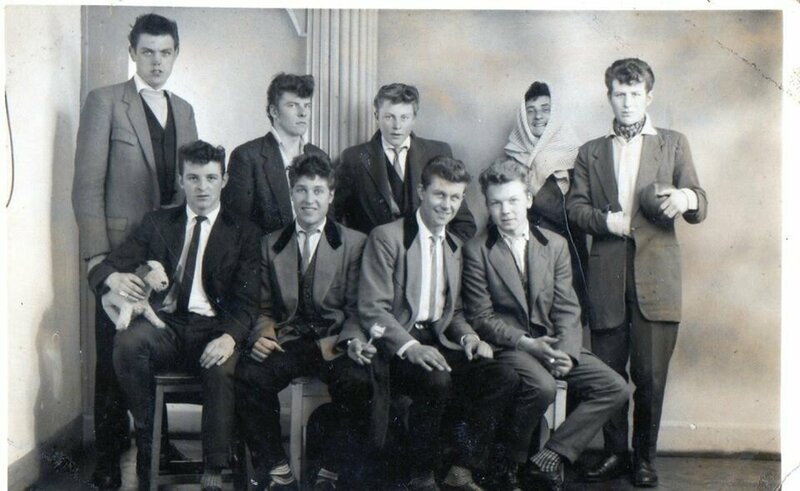 We all loved to get our photos taken, I am so glad I saved all mine, brings back great memories as some of these boys are not with us anymore. 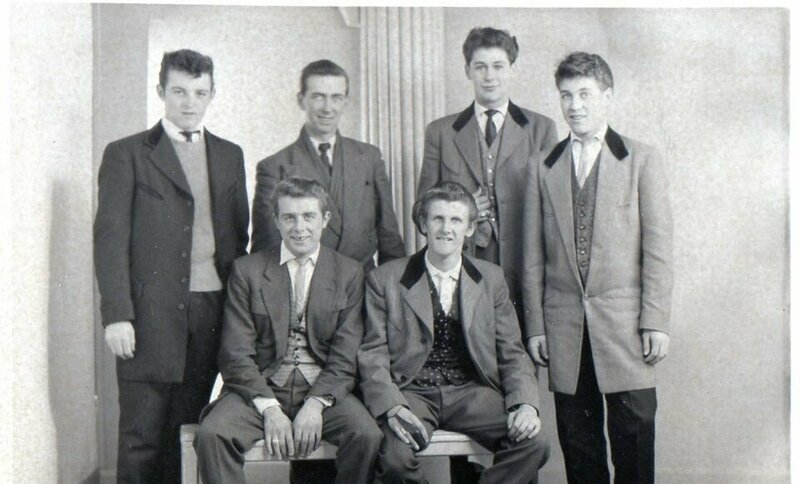 Back Row L to R: Colin Piper, Bob Absolem, Albie Deacon, John O'Neill and Micky Childs. Front Row L to R: Graham Butcher, Brian Frost, Johnny Moor and Alfie Gunner. 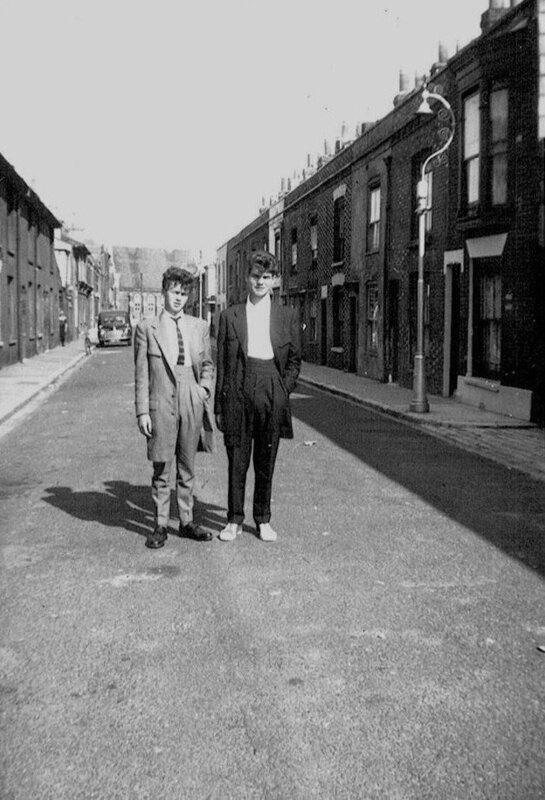 1957, Hugh and Eugene Finnegan, Somers Street, Portsmouth.